Ok @ignacio, also all is good ! DWC, DWF are good asset investments. Everybody is happy, me too. For the VaR, it's me who command my VaR. If i want move or not, i decide it with my smallest capital who attracted 5 investors, happy to win win. Nota: If my tone is not pleasant, you could fire me on the Community. I will respect your choice. For the VaR, it's me who command my VaR. I‘m really curious how it will work with the new ESMA margin requirements on your Darwin. @TheCheetah you are more than welcome to criticise DWF and DWC if you like, what I think is not acceptable is doubting our employees' professionalism. Trust me, they are quite smart and know what they do! Of course, no one will fire you out of nowhere, as I said, your opinion is welcome! 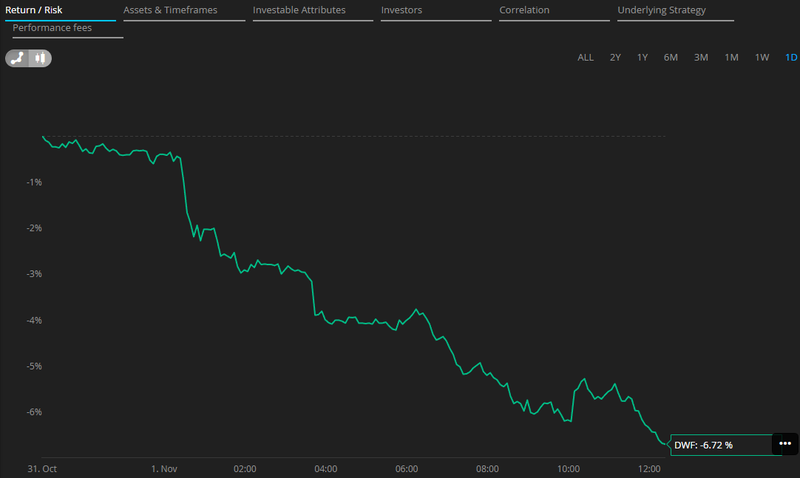 This post describes how DWC is both a Real-Time Sentiment Indicator and Tradable Security. Key features: mean-reverting asset for trading as-is and hedging. To me that is not compatible, maybe someone can edit the descriptions or explain it. If DWF uses the same algorithms as DWC but another timing and DWC is hedging the trader’s positions, DWF can’t be designed for a profitable long term Investment. The only idea I can get for a long term investment by these descriptions, Darwinex traders must be losers and obviously they are not - the loser is DWF. Please correct me if I didn’t get anything. Could they explain the bad behavior of DWF? Do not invest something just because you like the provider (Darwinex) . Results always have the priority, not fashions or hopes. Thanks for your message, @isabel03. We do understand your frustration and it is not a secret that we wished these products had performed better (in fact, a large amount of the funds invested in those products are ours and our employees’!). When we launched these products, we did warn about the short amount of data available to work on it. That being said, we deem that any use of the community’s data needs to be publicly disclosed. 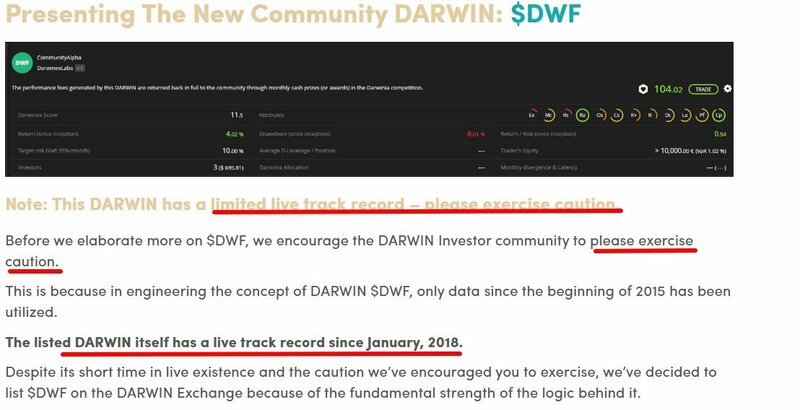 DarwinexLabs has made more than 15k in profits investing in DWC even though said DARWIN did not perform well. Imagine how people would feel if they hear that Darwinex is making money through the use of data that are not publicly available! These DARWINS were published, among others, for the sake of transparency. Further, we are going through unusual low-volatility market conditions. Under “normal” market conditions, the algorithm’s backtest performed better back in 2015, 2016 and 2017. DarwinexLabs keeps working in further products based on different approaches, same as any trader on our platform. That being said, in regard to your loss of confidence in “Darwinex products”, please bear in mind that ALL THE DARWINS are “Darwinex Products” and there are some good ones out there. All we can do at this stage is keep working hard to gain everyone’s trust, including yours.
. DarwinexLabs has made more than 15k in profits investing in DWC even though said DARWIN did not perform well. What we have to learn is that beating the market is extremely difficult, even for brokers and experienced quants. What is really wrong is over 1 MM of AUM after 3 months , so investors have to learn to be patient and unbiased. 2 or 3 quality articles don't substitute one or more years of trackrecord. I could only smile at your comment as this is the very first time you're not defending Darwinex. You have to search better, I have always been very critic with DWC/DWF . I am very critic also about DWEX and how it has been managed. Not to speak about my low opinion about timing and consistecy algos. The comment I made was not in reference to DWF or DWC. I have only one critic with DWC/DWF. I think that Darwin What the F... is a bad marketing idea. It can be but I have a different opinion. The nature of the darwins' population has changed much more than the volatility of the markets. DWF is an attempt to beat the market hedging loss averse traders, following th idea that such a class of strategies tend to be losers. DWF is just a different paramatrization of the same idea behind DWC. When a ruleset is wrong, results don't improve just with different parameters. To sum up my idea is that while hedging loss averse darwins was working 2 years ago it isn't working anymore today, because with the current population loss averse traders aren't losers anymore. DWF and DWC end of May, star of Jun (only 2 months ago! top allocations....) 3M AUM joined... now 1,4M reason to ask where is that 1,6M in other darwins? or lost from total invested on darwinex? it is a considerable amount considering that top 20 AUM is around 12M.. ( and it include that 1,4 of DWF/C. DWC and DWF are losers, this is the fact. On last 6M the loss is ~20% so it is very far from halvening an AUM. The explaination is that investors are taking advantage from local highs and retracements to get out from their bad investment. What the Fxxx today ? I noticed a, escape of investors since 2018 June (56 upto 20 investors). DWF, as it is named, will focus on longterm trading aiming to deliver positive returns. The Long term strategy diverges from negative intraday return.